When the BET subsidiary and previously staunch Bristol user North Western Road Car Co. found itself unable to continue buying its favourite make of chassis (due to the manufacturer falling under state-owned BTC ownership and only able to supply to other similarly owned companies), NWRCC management, not to be outdone, sought the services of the independent truck maker Atkinson Lorries (1933) Ltd. of Walton-le-Dale to produce an equivalent to the underfloor-engined Bristol LS model which they would no doubt have otherwise purchased. The new model was christened the Alpha, and the first ones were duly delivered to NWRCC in 1951. However the BET Group were having none of it and stepped in to force its companies to stick to its preferred choice of Leyland Tiger Cub or AEC Reliance. Atkinson continued with the Alpha though, which was initially offered as a mediumweight model, fitted with a choice of Gardner 4, 5 or 6HLW engines, and either an Atkinson 5-speed overdrive constant-mesh or David Brown 5-speed direct top synchromesh gearbox. At the 1953 Scottish Show they displayed an Alpha fitted with Self-Changing Gears semi-automatic gearbox – quoted as being the first to be fitted to a PSV chassis (Leyland – owner of SCG – had a minority shareholding in Atkinson at the time). At the same time a lightweight version was offered. Apart from orders for 40 for LUT, and 20 for Venture of Consett, the rest were mostly supplied as coaches in small or single numbers. Production diminished throughout the 1950’s, the model’s swansong occurring in 1963 when Sunderland Corporation surprised everyone by taking three updated 33ft. long buses with semi-automatic gearboxes and modern-style Marshall bodies, but these were the last of the line. LUT took a batch of ten in each year from 1952 to 1955, and 528 (TTD 297) seen here at their Atherton Depot was a model PL745H with Roe B44F body, new in 1954. Weren’t the first NWRCC examples delivered with single rear wheels, but the road holding, or lack of it, lead to the more normal twin rear wheels being subsequently fitted? Did any other operator take single wheel Alphas? If my memory isn’t faulty (and it often is these days) I have a feeling that Sunderland Corp’n took delivery of some earlier Alphas, with similar Roe bodies, in the mid-1950’s. A survivor from the three Atkinsons bought by Sunderland Corporation. I took the photo at the 2013 N.E.B.P.T rally at Seaburn, which is to the north of Sunderland, so no doubt the bus would have been used on services in the area at some time during its working life. Sorry folks, in my haste I forgot to add the fleet and registration numbers for the Sunderland Atkinson. WBR 248 fleet number 48. More photos of the vehicle were posted in my Metro Center May 2013 gallery. The NWRCC Alphas did have single rear wheels, something the company tinkered with on and off in the 1950s. Here’s an official photo of one of the earlier Alphas, with Roe bodies, which Sunderland Corp’n bought and I mentioned earlier. So upset was the North Western manager by the BET reaction he resigned and left the company. Just one minor point, John. Self Changing Gears did not succumb to Leyland control until 1957, when the Lancashire maker bought the Hawker Siddeley third of the shares in the company. Prior to that, the Wilson family, Hawker Siddeley and Leyland each owned a third. 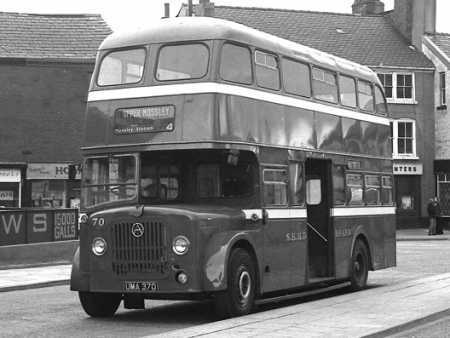 The Atkinson shown in Chris Hebbron’s picture was earlier one of two L644LWEXL long wheelbase models with front mounted vertical 4LW engines bought by Sunderland in 1956/7. 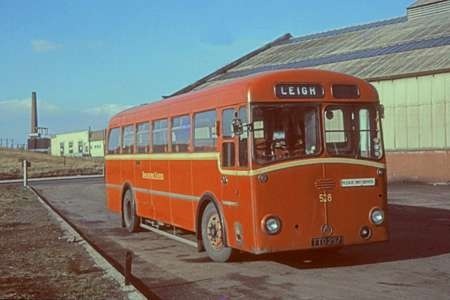 The Leyland shareholding in the Atkinson company proved to be the decisive factor in the tragic sale of Atkinson to Seddon in 1970. Leyland decided to take the Oldham money and run. It is surprising that a large proportion of the Atkinson buses had unusual bodies. All the North Western Alphas had rear entrance bodies, and many of the Lancashire United examples had centre-entrance standee bodies, as did four of those for SHMD Board. The last three for SHMD had front entrance standee bodies, and the one-off double decker had centre entrance. Even the front entrance Roe bodied Alphas for LUT had an unusual (but attractive) appearance, and the driver had an offside cab door. Surely the two Sunderland Atkinsons bought in the fifties were not Alphas, but modified lorry chassis. Just think, if the BET Group management had not been so awkward, North Western might have bought a couple of hundred Atkinson Alphas instead of Royal Tigers, Tiger Cubs and Reliances of the FDB, KDB and LDB series. Strange isn’t it. You would expect Atkinsons with their quality and traditional reputation and low volumes to be an ideal manufacturer for the bus industry. No, it has to be Leyland or AEC. Eventually, they all eat each other, aided by too much direction- are rear engines or double deckers the answer to everything- so we now have over-large, wallowing buses with all the control subtlety of a dodgem. Am I being unfair?! I tend to agree with Don’s comment about the lorry chassis. The layout is probably the most odd of all the Atkinson bus production as, to an extent, all the other body layouts followed traditional or, at least, accepted formats yet a long wheelbase with a double width door behind the front axle needs some explanation! The Atkinson L644 was a lorry chassis – L=Long wheelbase, 6=6 tonner, 4=4-wheel, 4=4cyl. The suffix LWEXL presumably means LW=Gardner LW (though this was not usually used on lorries, being taken for granted), EXL=Extra Long (being longer than the standard lwb lorry). I’ve only ever seen these on photographs, but always thought they looked rather good, and that Roe had made a very neat job of them. The double width door looks unusual on a front-engined single decker, and the grille looks like a throwback to the BMMO S6 or D5. It’s almost like a slightly longer and more substantial alternative to the Bristol SC. I’m told however that their appeal stopped with their appearance, and that they were rather unrefined in reality. 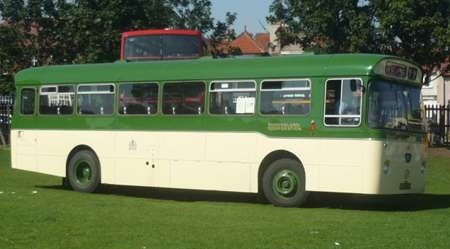 Although it was based upon a lorry chassis, one presumes that the frames of the Sunderland buses were dropped in the conventional psv fashion to permit a reasonable floor height. I entirely agree that the 4LW engine would have been a far from refined power unit, even with a flexible mounting. (Nonetheless, the prewar Dennis Lancet with four cylinder petrol or diesel power was noted for smooth running.) The 4LW had a capacity of 5.6 litres, almost exactly the same as the experimental 6LK engine made in the 1930s but not produced in volume. No doubt the 6LK would have been more costly to produce than the 4LW, but it would have given Gardner an effective, reliable, refined 5.7 litre 85 bhp high speed six cylinder engine, suitable for automotive applications where the 4LW was much too ponderous. An excellent opportunity was lost. Under Hugh Gardner’s autocratic management style the company’s production methods did not evolve with the passage of time, and were essentially very inefficient by the 1960s, a factor that was reflected in the level of output and the unit cost. During the 1968 strike in the foundry section, personnel from other parts of the Patricroft works stepped in to maintain production. It was discovered that the technique used for the sand core for one complex casting could be simplified, reducing the manufacturing time from 40 minutes to 12 seconds. No doubt similar economies could have been effected in other processes had the will been there to take a proper look. After the 1973 strike, during which some 600 skilled employees left the Patricroft firm for employment elsewhere, the continued demand for the LX series engines had to be met by ending production of the 4LK and 4/5/6LW ranges for which markets still existed. When, in the following year, Rolls Royce decided to pull out of making diesel engines, Paul Gardner suggested that the Patricroft firm should buy the Shrewsbury factory, equipped as it was with modern manufacturing plant. Hugh Gardner responded by threatening to resign, and the project was dropped. Paul was told to apologise for wasting the board’s time. What might have been! Thx for the insight into Gardner’s problem boss. So many livelihoods affected, often those of talented people by such high-handed and misguided behaviour. Can you say, Roger, why the Gardner strikes occurred and why R-R pulled out of road vehicle engine manufacture? Chris, the comprehensive record of Gardner history is the 2002 book by Graham Edge. In August 1968, a certain shop steward in the iron foundry shop took it upon himself, presumably arising from some grievance, to cast the name ‘Gardner’ upside down on the crankcase of the large and expensive 8L3B engine. He was repeatedly warned to no effect and was ultimately suspended. The other stewards in the foundry then called a strike that lasted until September, when the action collapsed and the staff returned to work, having lost their centenary bonus. The initial troublemaker left the plant soon afterwards. The 1973 dispute was more serious, and fell within a pattern of strikes that plagued almost all the UK motor manufacturing industries of the time. By the end of 1973, when settlement was made, production of engines at Patricroft had fallen to a level, 2937 units, that was half that of the two previous years. This strike was instrumental in the move by those manufacturers traditionally employing Gardner engines towards fitting other makes of motive power. Hugh Gardner was an autocrat and must surely have been an unreceptive individual at every negotiating table with the trades unions. It is possible that an undercurrent of labour dispute arose from personal resentment by the union representatives, but the eventual outcome was yet another tragedy for British industry. The appointment of Clayton Flint as Chairman in 1975, the first ‘non Family’ person ever to hold the post, led to more flexible management of the company and improved production efficiency, particularly in the foundry shop. The rigid resistance to change ceased to be, and Paul Gardner, at last, was permitted to take Gardner engines into the world of turbocharging. Sadly, it was all too late, and even the sale of the business to Hawker Siddeley could not save Gardner. New engines were rushed into production too soon, and reliability, hitherto synonymous with the name Gardner, began to fall short. In the recession of the 1980s, during which the smaller independent commercial vehicle makers began to fall by the wayside, Hawker Siddeley lost interest in Gardner and sold off the company to Perkins. The writing was finally on the wall. Perkins disposed of Gardner by 1994, and automotive engine production ceased soon afterwards, followed by marine production three years later. The residual engine parts and support business became Gardner Avon, but this is now a non trading company. Today, the so called Gardner group is a supplier to the aerospace industry. It has several sites in the UK, but Manchester is not one of them. The North Western manager who resigned when BET refused to approve the purchase of further Atkinsons was Mr H S Driver, the company’s chief engineer. He had appealed to try to have this decision overturned, but without success. He later became Gardner technical representative for Australasia, and did not return to the UK. Thanks, Roger, for that detailed, illuminating and depressing story, much of it so common in those days. That was when much of the Great went out of Great Britain! I’d been wondering what had happened to Gardner: there they were supplying engines, along came "uniformed service" and I sort of dropped out of bus-related business . . . then when I picked-up my interest again it was in a world without Gardner. I do remember reading somewhere that there was a specific reason why Sunderland ordered those long-wheelbase forward-entrance Atkinsons to that forma- but I can’t remember now what I read or where I read it. Something about a heavily-trafficked night/works service seems to ring a bell. Very grateful to Roger for the detailed account of Gardner’s sad slide into nothingness. Having no understanding of the business side of things, I went through life blissfully confident that Gardner’s products always had been, were and always would be the finest available on earth. Of course that was once true, but I had my illusion shattered one day at Dover, where a driver had open the back panel of his bus. (I can’t remember the make of vehicle, and was the engine a 6LXCT or did it have a slightly bigger bore?) I expected him to share my enthusiasm, but his tales were of woe, and I went away with a painfully updated understanding, although I still had no idea how long the problems had been festering. Also fascinated to read that a 6LK had actually been built. A friend used to fantasize about such an engine. It could have competed directly with the Perkins 6.354—though certainly not on price! Thanks Roger for your detailed account of the sad demise of Gardner. I always had (and still have) the utmost respect for their products, which were built to a very high standard as is well documented, and were often known as ‘the crème de la crème of diesel engines’. (Indeed, when the 6LXB was announced, it was regarded as the world’s most fuel-efficient diesel engine at 40% efficiency). It is also well known that Hugh Gardner was most dogmatic in his views on engine design and how the company was to be run, which no doubt maintained standards, but in the longer term stifled Gardner’s ability to move with the times. As Roger says, Paul Gardner eventually started to take the company forward but it was somehow too late. Certainly the new Gardner LYT engine fell short regarding reliability, and stories of broken crankshafts began to circulate. This was something unheard of with the LW/LX/LXB engines (unless serious maltreatment had occurred), despite their crankshafts not being of fully-hardened construction. The 6LXB continued to have a strong following in the bus market, and the ’30 tons and under’ truck market well into the ‘eighties. Then along came bus deregulation and privatisation, causing widespread disruption to full-sized vehicle manufacturers’ orders following an unpredicted swing to minibuses by operators. There was also, if memory serves correctly, a recession in the construction industry, and haulage companies were also being squeezed by competition from European hauliers. The likes of Volvo, Scania and DAF were also making inroads into the truck market, with more comfortable cabs and higher output engines. Such manufacturers built their own engines which did not help Gardner’s plight. It really is sad how the mighty have fallen. Forty years ago who would have predicted that Gardner, Leyland, Foden, ERF and Seddon-Atkinson would no longer exist in the early 21st century? Many Gardner engines had an afterlife, they were snapped up by showmen who converted them for use as fairground generators. Ironically, since the regulations for silent running generators came into force, many of those that didn’t end up going abroad have been sold to preservation groups, some for spares, but I know of one that will go into a bus which was bought minus and engine, and is currently being restored. Ian, following the apocalypse of deregulation, and the acquisition of the "split up" NBC companies by profiteers, I found myself, after five years in non psv work, working at Viscount, Peterborough, the western division of the Cambus outfit. One of the Olympians there was equipped with a 6LXCT engine for the Northampton service, which was operated jointly with Stagecoach United Counties. When outshopped from overhaul, it was often allocated to other services. If it was fully on song, this bus could really motor – I once reached an indicated 70 mph with it when endeavouring to recover lost time on the A1 route to Huntingdon – but the turbocharger arrangement was sadly lacking in durability, and regularly failed. The brakes on this bus were truly dreadful, well up to the tradition of PD3s of the past, and this also tempered one’s inclination to indulge in maximum power. In trying to catch up with other manufacturers in the brave new world of turbocharging, the later Gardner efforts were under developed and under capitalised. The eyes of the top brass at Hawker Siddeley moved instinctively to the net result figure at the bottom of the P/L sheet. The past industrial environment of steady development testing had irretrievably gone, and, after nine years of ownership, Hawker Siddeley lost interest. The sale of Gardner to Perkins in May 1986 was the final kiss of death. Perkins had already taken over the Rolls Royce diesel range, and serious investment in Gardner development was deemed commercially unrewarding. The introduction of the Euro emission regulations was the final blow. Perkins disposed of Gardner in August 1992, by which time most of the output consisted of engine remanufacturing/reconditioning. Perkins/RR and Cummins then ruled the roads and the waves, but they, too, were soon to be seriously threatened by the continental onslaught. Scania and DAF both based their success on developing the Leyland O.600/O.680, which they both originally built under licence. There is also uncorroborated evidence that there was a similar beginning to the Volvo story. Another case of the Thatcherite selling off of the family silver. ….and who, Brendan, would ever have foretold that the lone survivor of all the British mid/heavy transport manufacturers would be Dennis, albeit mainly in the bus field! Perkins is still around, but not in the transport field. Such proud names consigned to history. How lucky we were to have been around to experience and enjoy their products. Oh dear, I’m at risk of becoming maudlin! David, if you listen to a Scania you can hear the Lancashire accent! You’re right Chris, who indeed would have thought Dennis would rise to such a prominent position in the bus world bless ’em? And where did Wright’s spring from all of a sudden? Nice one Phil. I’ll listen more closely to Yorkshire Tiger’s Omnicity on the Bradford service next time I’m in Harrogate bus station. The accent is most noticeable on tickover. I can well understand how driving up towards the Air Balloon would bring out the Leyland in a Scania. Brendan. Wrights were around for years building school buses, welfare vehicles and libraries for appropriate "boards" in Northern Ireland. Their joint venture with GM to produce an advanced coach probably first brought them to attention here but it was almost certainly the Handibus – on the Dart – which set things flying. The use of Alusuisse and quality work didn’t harm them, either. Thanks for the info David. I am aware of the Handibus/Dart connection, but I had not realised that their history went quite so far back with vehicles produced for what we would probably term ‘Local Authority’ departments. They appeared to really take off following the arrival of the attractively styled Cadet/Renown-type single-deck bodies. The Wright-bodied vehicles for Blazefield certainly seem well put together and have stood the test of time in the various fleets. In some respects it could be argued that long term, Wright’s have taken up the slack left by the closure of ECW. I must admit however that I much preferred the styling of the latter. Regarding the North Western Atkinson Alphas being rear entrance I understood this was because many queue barriers etc were designed, at that time, for rear entrances (which had been standard until then). For example an allocation of Alphas were needed at Urmston to service the 22 (Levenshulme-Eccles) which was joint with Manchester Corporation, who used rear entrance Royal Tigers, as the very substantial barriers at Eccles Bus Station, Davyhulme Nags Head etc. were positioned to suit rear entrances. May I ask through this column, for more information (or where to find information) about the BET Preferred Suppliers list. I find this aspect of PSV history quite disturbing, that private companies could be dictated to in this way. One wonders how many BET group managers would have preferred to take Gardner engined products, and how different PSV history would have been given a level playing field. Allan, I’m not sure of your premise. BET owned each individual company. As owner it could dictate policy to its constituents which, though each had its own General Manager, was really a branch of the main company with a small degree of autonomy. The individual operating companies were not private companies and, as BET was a FTSE listed company, their results contributed to the group balance sheet and affected the share price. Nothing unusual in that in just about every sector of business. The classic case of North Western and Atkinson may be the case in point which has sparked your comment. BET had decided that the group would buy Leyland Royal Tigers and later, Tiger Cubs. The deal was financially beneficial to the group as a whole. The fact that NWRCC had its own preference that was overruled may well have been a bad operational decision where financial gain perhaps overcame common sense but in my long experience of working for and with companies within groups, in a number of industries, this is by no means unusual. The Aldershot & District Traction Company was owned in equal third parts by the BET, the THC (ex Southern Railway shareholding) and private shareholders, and this gave it some latitude in its vehicle choices, predominantly Dennis until the influx of the all conquering AEC Reliance. I don’t know if any other BET group companies still had an element of private shareholding up to the 1968 sell out to the government. The ‘delisting’ of certain suppliers, fundamentally in favour of AEC and Leyland, was prompted purely by the economies achievable through bulk ordering. Whether or not BET got the best vehicles through this arrangement is arguable. For example, some BET companies, notably the Northern General group, East Kent and, to a lesser extent, Southdown amongst others, were well satisfied with the Guy Arab, probably the most reliable and economic bus of its time, and they must have been less than pleased when further purchases were vetoed from ‘above’. Even so, individual companies still had some input into the specification of their orders. The Southdown full fronted PD3s, often called ‘Queen Marys’, were unlike anything else in the BET group, apart from the roughly similar Ribble machines. I am sure that other contributors can give similar examples. ps I should have added the East Kent full fronted Regent V ‘Puffins’ to the list of distinctive individual orders. Harking back to Gardner for a moment, were any engines ever fitted to diesel trains, British or foreign? I’m only ever aware of mainly AEC ones and, later, Cummins and possibly the odd Leyland, but it seems to me that the ever-reliable Gardner, which, on the surface, would have seemed the ideal choice, never penetrated the rail market. Or am I wrong? Following on from Roger Broughton’s comments on the S.H.M.D. Daimler CVD6 posting I thought it might be appropriate to post this view of the preserved S.H.M.D. Atkinson double-decker in Stalybridge bus station on 30th April 1978. The location still contains many props used for the filming of ‘Yanks’ and the less kind may have commented that Stalybridge had to be modernised to bring it up to the 1940s setting for the film! I encountered some of the filming here by chance. I arrived at Stalybridge on the late train from Leeds (the one-time York – Aberystwyth mail train) and saw a pool of light coming from the town centre. Going over to investigate I found in the bus station the two Keighley-West Yorkshire veterans (JUB 29 and CWX 671) given those Stalybridge and District fleet names and dirtied in a very effective manner. Also on standby was a Grey Cars Regal III which was even less historically accurate. I don’t recall much of this footage escaping the cutting room floor. Not sure about the Atkinson Mk II heading – surely this was a PD746 or possibly a PD746S, I’ve seen both versions used. And if it was a "Mark II" then what was a "Mark I"? Whatever its official designation it remains a lovely machine and thank heavens that it was preserved for posterity. One-off designs tend to have a short and unsuccessful life due to lack of proof testing that volume production brings but the Atkinson double decker seemed to have a full and active service life with SHMD. This is perhaps because it was built from well proven major component parts, ie a Gardner 6LW engine and I believe a Self-changing Gears semi-automatic gearbox. 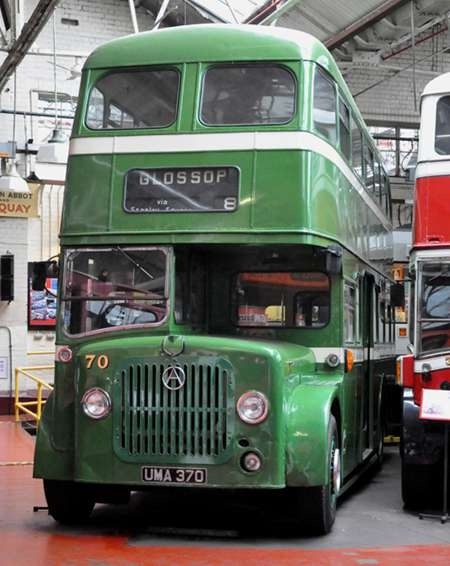 It is a great pity Atkinson did not produce more double-deckers as they obviously got the package right. Their sortie into single-deck production was largely at the behest of some North West operators who wanted a robust Gardner engined vehicle on the lines of the Bristol MW which was not available to non-BTC companies in the 1950’s. Atkinson supplied the Alpha saloon to LUT, North Western and SHMD at this time. LUT was fairly well wedded to Guy Arabs for its double deck purchases and North Western, requiring low-height vehicles chose the Dennis Loline so apart from the solitary SHMD vehicle there were no other double-deck deliveries from Atkinson. I have ridden on no.70 at Boyle Street and I agree it is a splendid machine. The centre-entrance makes it a doubly unusual vehicle. I understand this came about as the general manager at the time came from Blackpool and was influenced by those splendid Burlingham PD2’s. Arthur Brearley, the HPTD driving instructor during the 1960s, told me that the Atkinson PD746 was seriously considered by Halifax in the 1950s. In the event, further Daimlers arrived. I haven’t watched the excellent film "Yanks" for a good while now, but much of it was filmed in Keighley and I think the bus concerned was Keith Jenkinson’s Keighley-West Yorkshire Titan JUB 29 wasn’t it ?? Yes it was Keith Jenkinson’s JUB 29 Chris. I remember it spending a short time in West Yorkshire’s Body Shop for a general sprucing up after filming had finished. It was tucked snugly in the back left-hand corner (viewed from Westmoreland Street) and achieved almost ‘local celebrity’ status with some of the older staff during its brief stay. Like you, I’ve never seen the film, but know that quite a lot of the scenes were shot around Keighley and its railway station. That would tie in very nicely with the Keighley-West Yorkshire vehicle, not to mention the splendid engines of the Keighley & Worth Valley Railway. David Brown was a prolific supplier of gearboxes to lorry builders such as the likes of Atkinson, Foden and ERF in the 40’s 50’s and 60’s, usually mated to Gardner engines, so I wouldn’t be surprised that the only Atkinson double decker was so supplied. What I do not know is was David Brown gearboxes as popular with the bus chassis builders of the period? About D Brown gearboxes SHMD had 2 Daimler dds with DB gearboxes and they were nice to drive unlike the Atkinson dd which was orible, very slow change and very heavy steering. Bus manufacturers had a stronger preference for making their own gearboxes than lorry builders, but the users of David Brown gearboxes in PSVs I know of were BMMO (all postwar manual transmission models I think), Tilling-Stevens, Atkinson (Alpha), Bristol (SC4LK) and Daimler (CSG). The Daimler CSG was overtaken by events, soon being replaced by the CCG with Guy transmission when Daimler and Guy came under common control. Thank you for that info. Peter. Interesting to note that of the five chassis makes/models you list three of them would have been fitted with Gardner engines. What would be the normal engine choice for the Tilling-Stevens? The immediate post-war Tilling-Stevens Express models certainly had David Brown gearboxes and those I know of had Gardner 5LW or 6LW engines. The majority of post-war Expresses went to Hong Kong. They were sound chassis and these engines/gearboxes gave them great reliability. (One, I believe, has survived). Were that other chassis builders of the time – Crossley in particular, had done the same. The Bristol SU chassis also utilised a David Brown (5-speed) gearbox, but for some reason Bristol turned to Turner (no pun intended!) for gearboxes on the LH. Funny how to many of us, David Brown gearboxes seem more associated with lorries than buses, as Eric says. It’s interesting to learn that BMMO and Tilling-Stevens also used them. As an aside, when David Brown purchased Aston Martin many years ago, the letters DB were used on consecutive new models over the years, to denote the ownership. The alternative to Gardner engines in postwar Tilling-Stevens models was Meadows. The survivor, GOU 732 from memory, originally had a Meadows engine but now has a Gardner 6LW. If memory serves me, I believe that Hong Kong had the largest fleet, well over 100, of post-war Tilling-Stevens in the world and they lasted over 20 years in service. So pleased to read about the Atkinson 70. Took me into Manchester(Schooldays) daily when on the splendid fast 125 Glossop Hyde Manchester limited stop service in the fifties!. I remember drivers struggling with the gear box when it first came into service. A lovely vehicle to ride on but never up to the speed of the CVD6 vehicles 23-24-25 that worked the 125 so regularly. 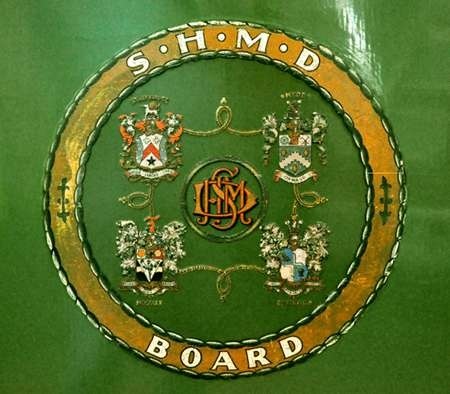 Great days – SHMD was transport at its best – and yes – we always called it "the Joint Board"
I came across the ‘S.H.M.D. No.70’ correspondence purely by chance. 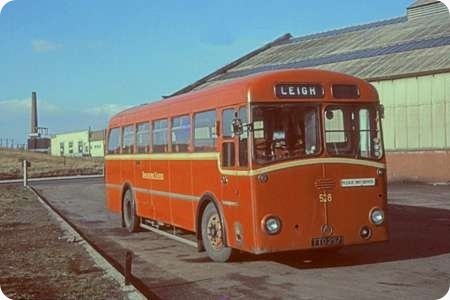 I travelled on the Atkinson bus in the mid-60s and remember its sluggish performance compared to that of the six, similarly-bodied, Daimlers bought by S.H.M.D. whose last two, open-platform, Daimler doubler-deckers-dating from 1959-seem to have been unpopular with drivers because of their ‘awkward’ (David Brown) gearboxes: one of them was heard to say that you could ‘have a meal’ in the time that it took to make a gear change. Given the hilly nature of the S.H.M.D.’s operating area, one wonders how such apparent ‘lemons’ came to be bought at a time when the Joint Board was taking its first Leyland PD2s that seemed to take very steep routes in their stride (unlike those PD2s operated by Manchester on shared routes). Lancashire United bought a 1959 Guy Arab (now preserved) which also had a David Brown gearbox: enthusiasts who test-drove this bus on a ‘flat’ circuit found the ‘box ‘tricky’ when selecting gears but were otherwise quite satisfied with it. 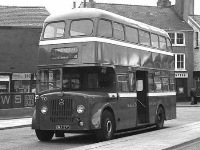 Philip Halstead said that the Atkinson single decker was designed and built at the behest of "some" North West operators. It was more specific than that. North Western Road Car was, to say the least, miffed to find itself remaining under the BET banner after the 1947 Transport Act which nationalised the Tilling companies in whose company NW, a dedicated Bristol user, felt at home. With the Act due to become law in 1948, and aware of long delivery times, NW ordered 122 Bristol single deckers before the terms of the Act restricted Bristol purchases to the nationalised Tilling Group. The last of these were delivered in 1950. Double deckers were in the minority in the fleet and NW was seemingly happy with its PD1 and PD2 purchases in the late 1940s and plans to re-body its 1938/9 K5Gs and austerity Guy Arabs with Northern Coach Builders bodies, chosen because a senior NCB manager was ex-Eastern Coach Works. A spanner was thrown in the works when NCB suddenly closed on the death of its owner and the re-bodying contract passed to Willowbrook. Much of the double decker territory was relatively flat around Stockport, Manchester and out on the Cheshire Plain. The singles however had to tackle parts of the Pennines and the Peak District and the Gardner powerplant was deemed necessary. The problem was the favoured Gardner engine was only available powering products from Coventry, Wolverhampton Sandbach and Guildford – none of which suited. A massive rebodying programme of the pre war Bristol singles was implemented and what were effectively "new" Bristols continued to appear until 1952 after which further complex body swapping went on well into the late 1950s. 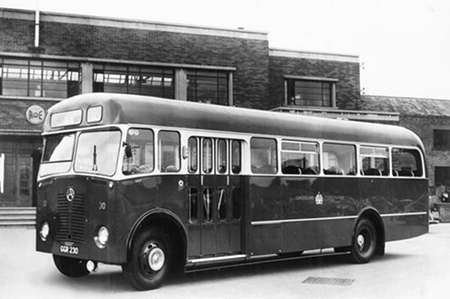 In 1949 Atkinsons were approached by NW Chief Engineer H Stuart Driver and they agreed to build a single decker to NW’s "proxy Bristol" requirements. The first two with Weymann bodies arrived in 1951 and were compared to two Leyland/Weymann Olympics. Whilst they had rear entrances, compared to the Leylands’ front entrance, everything else was vastly in their favour. A further 14 followed in 1953, the last two were bodied by Willowbrook as "lightweight" vehicles with single rear wheels, the last had a 4 cylinder Gardner engine in place of the 5LW but was found to be unsatisfactory. An order for 100 5LW powered lightweights was placed but this was countermanded by the BET main board. Stuart Driver made a presentation to the BET main board showing the benefits of the Atkinson against the BET now preferred Leyland Royal Tiger. His presentation was rejected. He caught the first train back to Stockport, cleared his desk and walked out. NW, for better or worse got Royal Tigers and later Tiger Cubs. The Atkinsons gave around 13/14 years service and, had they been front entrance, would have lasted longer in OMO service. I rode on these to school many times and they were quick, though the rear entrance with steep steps didn’t help loading and unloading. Meanwhile LUT had been watching developments between NW and Atkinsons and ordered vehicles which were to be delivered in 1952 with front entrance bodies on 6 and centre entrance bodies on 4. Between 1952 and 1955 LUT amassed no less than 40 of the type. SHMD was a dedicated Thorneycroft user. When production of Thorneycroft buses ceased, their allegiance changed to Daimler. They bought a Freeline single decker in 1952 fitted with a centre entrance standee 60 passenger capacity body. The body was deemed a success, the chassis wasn’t, so follow on orders for the body were placed on Atkinson chassis. The deliveries between 1953 and 1956 were centre entrance, the last in 1959 were front entrance but were arranged with 34 seats and a standee area for 26. A total of 7 single deckers and the double decker were purchased by SHMD, the double decker being an attempt to find an alternative to the Daimler chassis then dominating the double decker fleet. When Frank Brimelow took over as SHMD General manager in 1956 he took two batches of PD2s. These had fully rated 0.600 engines – the reason they outperformed their Manchester counterparts which, under Albert Neal’s parsimonious pursuit of economies, de-rated his engines to 100bhp. Had NW got its way, had the double decker been built for a more substantial operator, had the prototype not been with an oddball body layout, had the Bamber Bridge facility been larger, had ifs and ands been pots and pans……………you know what I mean. During the brief period when I was a Schedules Clerk at SELNEC in the early 70’s, I worked with a chap called Peter Caunt who had worked at North Western, both in the offices and as a driver. In his inimitably enthusiastic manner he recalled driving the Atkinsons, which he referred to as the ‘fastest coal lorries in the north’. He said they were very quick – even more so than the Reliances – but that they had very heavy steering and gearchanges making them hard work for a full shift unless you were built like Goliath. The accelerator pedal was of the organ type, which at only low revs had already reached a horizontal aspect. Pressing down any further caused the pedal to point downwards towards its front end causing great discomfort to one’s ankle – especially on a long hill climb. Drivers resorted to attaching wooden wedges to the pedal to alleviate the problem. I remember him telling me how one of them had suffered a gearbox failure and an ‘engineering team’ was despatched by the manufacturer to replace it. When they turned up they were mistaken for gypsies and almost thrown off the premises. ‘A right pair of toe-rags’, Peter quoted, they were not allowed into the works, so the bus was shunted into the yard and they did the entire job under the crudest of conditions using just brute strength and with the meagerest of tools. Years later (1984) he went on to write his bus driving memoirs in ‘North Western – A Driver’s Reminiscences’, to which I have referred to jog my memory. It still turns up regularly on bookstalls at rallies. I was a fitter at North Western at Stockport for 10 years. The Atkinson Alfa’s had 5HLW Gardners and we had some with 6HLW Gardners these all had Atkinsons own gearboxes (copy of D Brown), not very good. We had two light weight Alfas with single rear wheels these had 5HLW Gardners and genuine David Brown gearboxes. Regarding SHMD 70 Atky it was a great bus to drive. The steering was very heavy indeed. It was used for the express route from Manchester where it left and did not stop until it was in our area. The shift was I think 4 times per evening and everyone (just once fell for it) though it was a good payer but in reality it was a full duty. Once it got going it Flew!! Stopping was a concern.!! It used to terminate in Carrbrook I think (a long time ago so could be wrong). Happy day’s. As many readers of these columns will be aware, this was the only double decker Atkinson ever built, and according to various sources this was one of the reasons they declined an invitation to produce a clone of the Daimler Fleetline. That clone became the Dennis Dominator. UMA 370 managed to join the ranks of the preserved, and we see her in the GM Museum at Boyle Street on 19 August 2012. Conditions there were a little cramped, to say the least, at the time of my visit. Still, I did capture a view of the Crest. As many people will be aware, the "knight" radiator mascot from this vehicle was stolen from the Boyle St museum recently. It is believed to be unique, so if anybody notices it anywhere please get in touch with the GMTS website. Incidentally, does anybody know why Atkinson put a knight motif on it in the first place? I’ve always suspected that they were sort of imitating Guy’s Indian chief mascot. The knight motif was an allusion to the expression "Knights of the Road", a term that was once, but emphatically not nowadays, applied to the lorry driving fraternity. Oh, Roger! There are, as we all know, some bad eggs in the bus industry as well, but the professional truck driver is several rungs further up the ladder of ‘knighthood’ than the average white van man . . . In the 1960s Atkinson produced a range of lorries with ‘Knight’ in the name – Black Knight, Gold Knight and Silver Knight spring to mind – and appropriate badges were often seen attached to the radiators. This has triggered memories of W J Riding’s immaculate fleet of dark blue and silver-grey Atkinson lorries, which were a familiar sight on the roads at that time. 18 months on; did the missing mascot ever turn up? Has anyone tried to make ‘a reasonable facsimile’ of it,using images to work from?